Madrona Labs – Kaivo Out Now! Beta testing Kaivo has been a blast and if you’re familiar with Madrona Labs’ Aalto, you should be familiar with the architecture of Kaivo, however the sounds are nothing alike. Physical modeling and granular made fun. Surachai presets are coming with the next update. Kaivo, a new software synthesizer from Madrona Labs, is now available for Mac OS and Windows. Kaivo combines two powerful synthesis techniques, granular synthesis and physical modeling, with a patchable interface designed for ease of use. 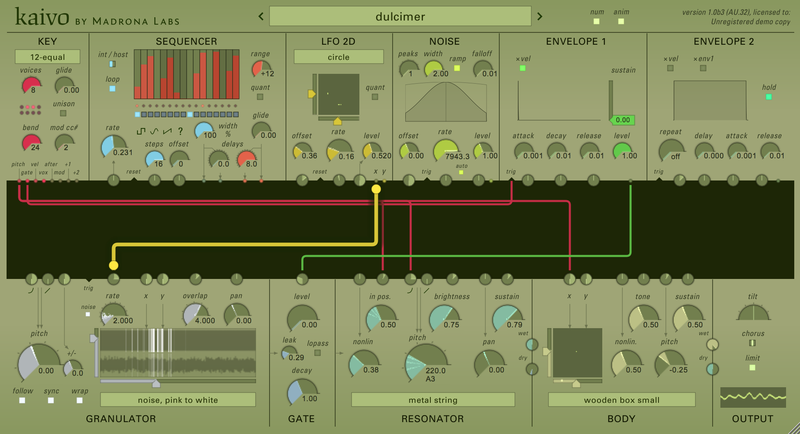 Kaivo is available in AU and VST formats for Mac OS and in VST format for Windows. Both Mac and Windows versions are fully 32- and 64-bit compatible. System requirements: Mac versions require OS 10.6.8 or higher. Windows versions require Windows 7 or 8. All versions require a 1.6GHz Intel Core Duo processor or higher. Kaivo is available to purchase at the Madrona Labs website for $129. Free demo versions are available for download. For more information about Madrona Labs and to purchase software, visit the website at http://madronalabs.com. Irregular Machine from joseph fraioli on Vimeo. A patch exploring the shifting of trigger start points to create complex evolving patterns with preset sequencing of mutable instruments braids and the cyclonix shapeshifter . 4ms Quad Clocking Harmonies (Modular Lullaby) from Richard Devine on Vimeo. Nebulæ from joseph fraioli on Vimeo. a patch utilizing the qu-bit electronix nebulæ to create evolving tonal drones which form a basis for patterns and gestural events. Introducing the MakeNoise Teleplexer Module (First Look) from Richard Devine on Vimeo. The Make Noise TELEPLEXER is a telegraph style multiplexer. It is used for manual distribution, adding and subtracting of signals. The user interface is inspired by telegraphy as the user taps the tips of patch cables (patched at one end to a source) to the conductive plates to determine where and how the source signal is distributed. Patch science for the show on Friday (LA)! Our buddy Joseph Fraioli ripping it. 5hifting Shap3s from joseph fraioli on Vimeo. clock source and main modulation source is coming form the livewire chaos computer. clock sources are multiplied, divided, and additionally modulated by the 4ms RCD and SCM, make noise wogglebug, pressure points, brains, tiptop z8000, SSF propagate and pamelas workout.